Fig. 3-19. Motion of the Lines of Apsides Due to the Earth's Oblateness less, which causes the line of apsides to rotate opposite the direction of motion while the satellite is over the pole. 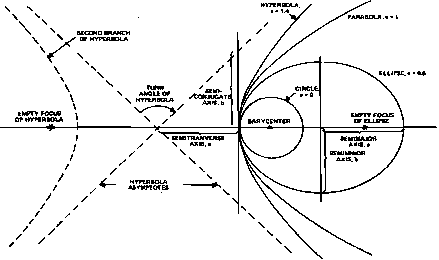 In a polar orbit (i'=90 deg), a satellite spends part of the time over the equator where the gravitational force is larger than the mean and part of the time over the poles where it is smaller. It can be shown that for polar orbits the net «ffect is rotation of the line of apsides opposite the direction of motion, although the rate of rotation is less than for equatorial orbits. As described in Section 5.2 and Appendix G, the oblateness of the Earth is treated analytically by expanding the gravitational potential in a series of spherical harmonics. The first term in the expansion provides the force resulting from a point mass. The second term, called J2 perturbations (from the second or J2 coefficient in the expansion), represents the modification to the mean force due to the oblateness of the Earth. Higher order terms represent effects due to the deviation of the shape of the Earth from a simple ellipsoid. Values of the principal coefficients are given in Appendix L; additional coefficients are given by Allen . where M0 is the mean anomaly at the epoch /„. Note that the mean anomaly is measured relative to the moving perigee. Each of these equations reduces to the nonperturbed form when J2~0. where (/ — tg) is in days, Q is in degrees, a is the semimajor axis in kilometres, e is the eccentricity, i is the inclination, and is £2 at the epoch time /„. In the final two forms above, n is approximated by n^ which may produce an error as large as 0.1% in the dSl/dt term.